In this disarmingly simple book, Oshry strips away much of the mystery and mythology of organizational life. Part I deals with "Internal Warfare," a painfully familiar scenario of organizational life. 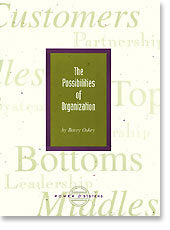 Part II takes you into the distinctly different worlds of Tops, Middles, Bottoms and Customers of organizations. You see how misunderstandings and conflict develop across "worlds" and how cooperation can be achieved. Part III confronts you with critical choices faced every day -- choices that can transform your life and the life of your organization. "Rarely do you find a book that is entertaining, readable useful and inspiring all at once, but ‘The Possibilities Of Organization’ fits the bill."